The website Five Books has a simple proposition: it asks people to nominate five books on a subject and then it interviews them about their choices. Anyway, I was privileged to talk to Bea Wilford of Five Books about futures and futures books recently, and the interview has now appeared on the site. Obviously you can read the whole interview at Five Books, but when you have to explain what you do and why to an interested listener, they’re not the only person who’s learning; you’re also learning yourself. So I thought I’d mention in this post a couple of things that struck me. 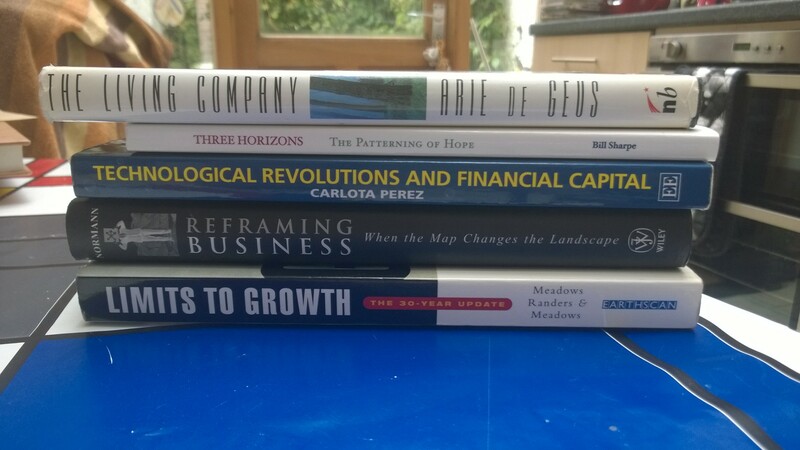 The first is that both the first two books underline the importance of the connection between learning about the future and acting on it. “The purpose of looking at the future is to disturb the present”, said Gaston Berger. But futures work needs to create space for change in a way that connects these, which is one of the strengths of the Three Horizons model. It’s easy to get into thinking ‘those first horizon people, they’re bad.’ You see innovation in horizon 2. But equally – as [Bill Sharpe] points out – you also need most of the Horizon 1 systems to carry on functioning. We expect to be able to get money out of the wall when you put a cash card into it. We expect the light to come on when we turn on the light switch – maybe not in all parts of the world but certainly in the UK. Even if you want it to change you have to have a way of changing without destroying what’s there at the moment. That’s a source of either systemic breakdown or, on an individual level, of nervous breakdown: I must kill everything that’s happening at the moment. That is not the way change happens in a productive way. And we know from lots and lots of historical examples that when change does happen in that disruptive fashion – you completely destroy the existing system – typically you get a lot of misery in the short term and then it replicates itself later on because it hasn’t changed, it’s just been killed. The second, thinking about Carlota Perez, and also The Limits To Growth, is that although futurists say, “There are no future facts“, and that futures work is not about prediction, there are recurring patterns which help us to consider, and to anticipate, the shape of change, and, indeed, the speed of change. The future is complex (and indeed is a complex system) but it is not completely random or entirely emergent. And those patterns of change include delays and feedback and so on, one of the critical lessons from The Limits To Growth. At the moment we’re in an overshoot and collapse path, but the first thing is that they’re very clear we can change that, we can still change that now. The second thing is, when you talk to the technologists and the economists a lot of their models assume that things happen straight away. This is a system dynamics model, so it’s got a lot of delays, it’s got a lot of buffers. No matter how good the technology is – and we learn this from Carlota Perez as well – it takes time. Sometimes putting a technology fix in shoves the can down the road rather than fixing the problem. Sometimes it just doesn’t come in fast enough to solve the problem. Given where we are – exceeding our planetary limits – this is probably the single most important futures book out there right now. For both the reasons that the core model is clearly reputable now – it’s proven itself over time – and also because it does have some observations about how we’d need to change to make change happen, to get out of overshoot and collapse. There’s a state in which you overshoot and oscillate, where you’re sometimes over the limits and sometimes under the limits, which gives you enough capacity to get back. We’re getting alarmingly close to the point where we don’t even have that option any more. So, according to that model, you’re thinking about the individual unconscious? Companies always have a corporate unconscious. If you think about corporate culture, the classic phrase about corporate culture is ‘the way we do things round here’. But what tends to sit behind ‘the way we do things round here’ is a set of assumptions which came from somewhere, but nobody really knows where any more. The whole interview is here. The image at the top of the post is by Andrew Curry, published here under a Creative Commons licence.